Disclosed herein is a composition comprising at least one fluorescent dye and at least one insoluble polyorganosiloxane conditioning polymer, processes using this composition, and a device. Further disclosed herein is the use of compositions comprising at least one fluorescent dye and at least one insoluble polyorganosiloxane conditioning polymer, for dyeing human keratin materials, for example artificially dyed and/or pigmented hair and dark skin, with a tightening effect. This application claims benefit of U.S. Provisional Application No. 60/468,079, filed May 6, 2003. Disclosed herein is a composition comprising at least one fluorescent dye and at least one insoluble polyorganosiloxane conditioning polymer, and also processes and a device for using these compositions. Also disclosed herein is the use of compositions comprising at least one fluorescent dye and at least one insoluble polyorganosiloxane conditioning polymer, for dyeing with a lightening effect human keratin materials, such as keratin fibers, e.g., artificially dyed and/or pigmented hair, and also dark skin. The substances most commonly used as bleaching agents are hydroquinone and its derivatives, kojic acid and its derivatives, azelaic acid, arbutin and its derivatives, alone or in combination with other active agents. In addition, hydroquinone and its derivatives are used in an amount that is effective to produce a visible bleaching effect. In particular, hydroquinone is known for its cytotoxicity towards melanocytes. There is thus still a need for cosmetic compositions that may allow a lighter, uniform, homogeneous skin tone of natural appearance to be obtained, wherein these compositions may have satisfactory transparency after application to the skin. The first is semi-permanent dyeing, or direct dyeing, which uses dyes capable of giving the hair's natural color a more or less pronounced modification that may withstand shampooing several times. These dyes are known as direct dyes and may be used in two different ways. The colorations may be performed by applying the composition containing the at least one direct dye directly to the keratin fibers, or by applying a mixture, prepared extemporaneously, of a composition containing the at least one direct dye with a composition containing at least one oxidizing bleaching agent, which may be aqueous hydrogen peroxide solution. As used herein, such a process is termed “lightening direct dyeing”. The second is permanent dyeing or oxidation dyeing. This is performed with “oxidation” dye precursors, which may be colorless or weakly colored compounds that, once mixed with oxidizing products, at the time of use, may give rise to colored compounds and dyes via a process of oxidative condensation. It is often necessary to combine one or more direct dyes with the oxidation bases and couplers in order to neutralize or attenuate the shades with too much of a red, orange, or golden glint or, on the contrary, to accentuate these red, orange, or golden glints. Among the available direct dyes, nitrobenzene direct dyes may not be sufficiently strong, and indoamines, quinone dyes, and natural dyes may have a low affinity for keratin fibers and consequently may lead to colorations that are not sufficiently fast with respect to the various treatments to which the fibers may be subjected, for example with respect to shampooing. In addition, there is a need to obtain a lightening effect on human keratin fibers. This lightening is conventionally obtained via a process of bleaching the melanins of the hair via an oxidizing system comprising hydrogen peroxide optionally combined with persalts. This bleaching system has the drawback of degrading the keratin fibers and of impairing their cosmetic properties. Thus, one objective of the present inventors is to solve the problems mentioned above and to propose a composition that has good dyeing affinity for keratin materials, such as keratin fibers, good resistance properties with respect to external agents, for example with respect to shampooing, and that also makes it possible to obtain lightening without impairing the treated material, such as the keratin fibers. It has thus been found, surprisingly and unexpectedly, that the use of at least one fluorescent dye, such as those in the orange range, in the presence of at least one insoluble polyorganosiloxane conditioning polymer as disclosed herein, may allow these objectives to be achieved. One embodiment disclosed herein is thus a composition comprising, in a cosmetically acceptable medium, at least one fluorescent dye that is soluble in the medium and at least one conditioning polymer that is insoluble in the medium, wherein the at least one conditioning polymer is chosen from polyorganosiloxanes that do not bear an amine group; the composition not comprising, as the at least one fluorescent agent, 2-[2-(4-dialkylamino)phenylethenyl]-1-alkylpyridinium in which the alkyl radical of the pyridinium nucleus is chosen from methyl and ethyl radicals, the alkyl radical of the benzene nucleus represents a methyl radical, and the counterion is a halide. Another embodiment concerns the use of a composition comprising, in a cosmetically acceptable medium, at least one fluorescent dye soluble in the medium, and at least one conditioning polymer insoluble in the medium, wherein the at least one insoluble conditioning polymer is chosen from polyorganosiloxanes that do not bear an amine group, for dyeing human keratin materials with a lightening effect. Another embodiment is a multi-compartment device for dyeing and/or lightening keratin fibers, comprising at least one compartment containing the composition disclosed herein, and at least one other compartment containing a composition comprising at least one oxidizing agent. The compositions disclosed herein may allow better fixing of the at least one fluorescent dye onto the keratin materials, which may be reflected by an increased fluorescent effect and a lightening effect that is greater than that obtained with the at least one fluorescent dye used alone. Other characteristics and advantages of the embodiments disclosed herein will emerge more clearly on reading the description and the example that follows. As has been mentioned previously, the composition disclosed herein comprises at least one fluorescent dye and at least one insoluble polyorganosiloxane conditioning polymer. A fluorescent dye as used herein is to be differentiated from an optical brightener. Optical brighteners, which are also known as brighteners, fluorescent brighteners, fluorescent brightening agents, fluorescent whitening agents, whiteners, and fluorescent whiteners, are colorless transparent compounds, which do not dye because they do not absorb light in the visible region, but only in the ultraviolet region (wavelengths ranging from 200 to 400 nanometers), and convert the absorbed energy into fluorescent light of a longer wavelength emitted in the visible region of the spectrum. The color impression is then generated solely by purely fluorescent light that is predominantly blue (wavelengths ranging from 400 to 500 nanometers). Finally, the fluorescent dye used in the composition is soluble in the medium of the composition. The fluorescent dye differs therein from a fluorescent pigment, which itself is insoluble in the medium of the composition. 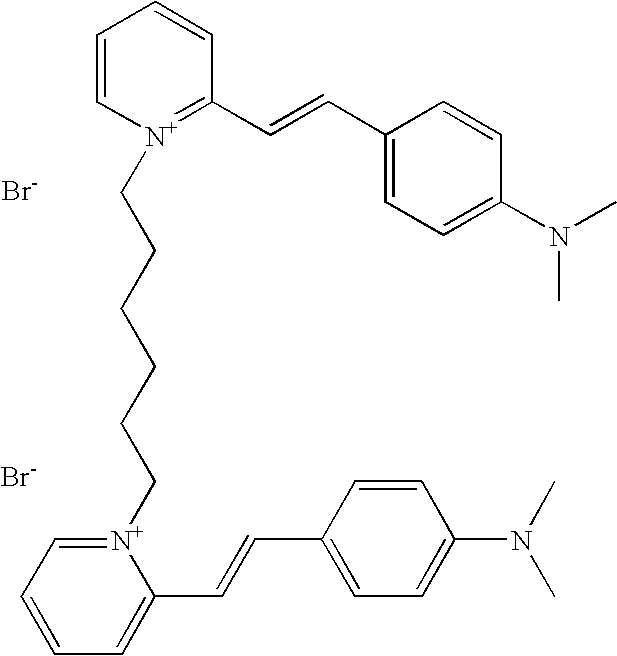 The fluorescent dye used in the composition disclosed herein, which is optionally neutralized, is soluble in the medium of the composition to at least 0.001 g/l, for example to at least 0.5 g/l, or for example to at least 1 g/l and, according to one embodiment, to at least 5 g/l at a temperature ranging from 15° C. to 25° C.
Moreover, according to one embodiment described herein, the composition does not comprise, as at least one fluorescent dye, a 2-[2-(4-dialkylamino)phenylethenyl]-1-alkylpyridinium in which the alkyl radical of the pyridinium nucleus is chosen from methyl and ethyl radicals, the alkyl radical of the benzene nucleus represents a methyl radical, and the counterion is a halide. In accordance with another embodiment, the composition does not comprise, as at least one fluorescent dye, any compounds chosen from azo, azomethine, and methine monocationic heterocyclic fluorescent dyes. The fluorescent dyes according to certain embodiments are dyes in the orange range. In certain embodiments, the fluorescent dyes may lead to a reflectance maximum that is in the wavelength range from 500 to 650 nanometers, for example in the wavelength range from 550 to 620 nanometers. As examples of fluorescent dyes that may be used, mention may be made of the fluorescent dyes belonging to the following families: naphthalimides; cationic coumarins; non-cationic coumarins; xanthenodiquinolizines (such as sulphorhodamines); azaxanthenes; naphtholactams; azlactones; oxazines; thiazines; dioxazines; azo, azomethine, and methine polycationic fluorescent dyes, alone or as mixtures, and for example fluorescent dyes belonging to the following families: naphthalimides; cationic coumarins; non-cationic coumarins; azaxanthenes; naphtholactams; azlactones; oxazines; thiazines; dioxazines; azo, azomethine, and methine polycationic fluorescent dyes, alone or as mixtures. n being an integer at least equal to 2 and at most equal to the number of cationic charges present in the fluorescent dye compound. As used herein, the term “hetero atoms” means oxygen and nitrogen atoms. Among the groups bearing such atoms that may be mentioned, inter alia, are hydroxyl, alkoxy, carbonyl, amino, ammonium, amido (—N—CO—), and carboxyl (—O—CO— and —CO—O—) groups. As regards the alkenyl groups, they may comprise at least one unsaturated carbon-carbon bond (e.g., —C═C—), such as one carbon-carbon double bond. together with the nitrogen atom, heterocyclic radicals chosen from pyrrolo, pyrrolidino, imidazolino, imidazolo, imidazolium, pyrazolino, piperazino, morpholino, morpholo, pyrazolo, and triazoloradicals, optionally substituted with at least one linear or branched alkyl radical comprising 1 to 4 carbon atoms, wherein said at least one alkyl radical is optionally interrupted and/or optionally substituted with at least one of nitrogen atoms, oxygen atoms, groups bearing at least one nitrogen atom, and groups bearing at least one oxygen atom. As regards the above-mentioned amino and ammonium radicals, the radicals borne by the nitrogen atom may be identical or different and may for example be chosen from hydrogen atoms, C1–C10 radicals, such as C1–C4 alkyl radicals, and arylalkyl radicals in which, for example, the aryl group comprises 6 carbon atoms and the alkyl groupl comprises 1 to 10 carbon atoms, such as 1 to 4 carbon atoms. According to one embodiment disclosed herein, the radicals R1 and R2, which may be identical or different, are chosen from hydrogen atoms; linear and branched C1–C6 alkyl radicals; C2–C6 alkyl radicals substituted with at least one hydroxyl radical; C2–C6 alkyl radicals bearing at least one group chosen from amino and ammonium groups; C2–C6 chloroalkyl radicals; C2–C6 alkyl radicals interrupted with at least one of oxygen atoms and groups bearing an oxygen atom (for example ester); aromatic radicals, for instance phenyl, benzyl, and 4-methylphenyl; heterocyclic radicals such as pyrrolo, pyrrolidino, imidazolo, imidazolino, imidazolium, piperazino, morpholo, morpholino, pyrazolo, and triazolo radicals, optionally substituted with at least one of C1–C6 alkyls and aromatic radicals. In certain embodiments, the radicals R1 and R2, which may be identical or different, are chosen from hydrogen atoms, linear and branched C1–C6 alkyl radicals such as methyl, ethyl, n-butyl, and n-propyl radicals; 2-hydroxyethyl; alkyltrimethylammonium and alkyltriethylammonium radicals, the alkyl radical being a linear C2–C6 alkyl radical; (di)-alkylmethylamino and (di)alkylethylamino radicals, the alkyl radical being a linear C1–C6 alkyl radical; —CH2CH2Cl; —(CH2)n—OCH3 and —(CH2)n—OCH2CH3 with n being an integer ranging from 2 to 6; —CH2CH2—OCOCH3; and —CH2CH2COOCH3. In certain embodiments, the radicals R1 and R2, which may be identical or different, may for example be identical and be chosen from methyl radicals and ethyl radicals. The radicals R1 and R2, which may be identical or different, may also be chosen from heterocyclic radicals such as pyrrolidino, 3-aminopyrrolidino, 3-(dimethyl)-aminopyrrolidino, 3-(trimethyl)aminopyrrolidino, 2,5-dimethylpyrrolo, 1H-imidazolo, 4-methylpiperazino, 4-benzylpiperazino, morpholo, 3,5-(tert-butyl)-1H-pyrazolo, 1H-pyrazolo, and 1H-1,2,4-triazolo radicals. in which R′ is chosen from a hydrogen atom, C1–C3 alkyl radicals, —CH2CH2OH, and —CH2CH2OCH3. In accordance with certain embodiments disclosed herein, R5, which may be identical or different, is chosen from hydrogen atoms, fluorine atoms, chlorine atoms, and linear and branched alkyl radicals comprising 1 to 4 carbon atoms optionally interrupted with at least one of oxygen atoms and nitrogen atoms. 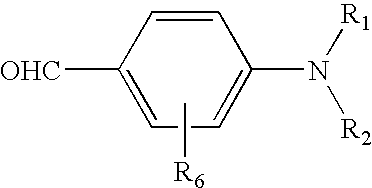 It is pointed out that the substituent R5, if it is other than hydrogen, may be in the 3 or 5 position relative to the carbon of the ring bearing the nitrogen substituted with the radicals R1 and R2, for example in position 3 relative to that carbon. In certain other embodiments, the radicals R5, which may be identical or different, are chosen from hydrogen atoms; linear and branched C1–C4 alkyl radicals; —O—R51 where R51 is a linear C1–C4 alkyl radical; —R52—O—CH3 where R52 is a linear C2–C3 alkyl radical; —R53—N(R54)2 where R53 is a linear C2–C3 alkyl radical and R54, which may be identical or different, is chosen from hydrogen atoms and methyl radicals. For example, R5, which may be identical or different, is chosen from hydrogen atoms, methyl radicals, and methoxy radicals, and R5 may be a hydrogen atom. According to one embodiment, the radicals R6, which may be identical or different, are chosen from hydrogen atoms; linear and branched C1–C4 alkyl radicals; —X wherein X is chosen from chlorine, bromine, and fluorine atoms; —R61—O—R62 where R61 is a linear C2–C3 alkyl radical and R62 is a methyl radical; —R63—N(R64)2 where R63 is a linear C2–C3 alkyl radical and R64, which may be identical or different, is chosen from hydrogen atoms and methyl radicals; —N(R65)2 in which R65, which may be identical or different, is chosen from hydrogen atoms and a linear C2–C3 alkyl radical; —NHCOR66 where R66 is chosen from C1–C2 alkyl radicals, C1–C2 chloroalkyl radicals, radicals —R67—NH2, —R67—NH(CH3), —R67—N(CH3)2, —R67—N+(CH3)3, and —R67—N+(CH2CH3)3 where R67 is a C1–C2 alkyl radical. The substituent R6, if it is other than hydrogen, may be in the 2 or 4 position relative to the nitrogen atom of the pyridinium ring, for example in position 4 relative to that nitrogen atom. In certain embodiments, these radicals R6, which may be identical or different, are chosen from hydrogen atoms, methyl radicals, and ethyl radicals, and R6 for example is a hydrogen atom. As regards the radicals R3 and R4, these radicals, which may be identical or different, may be chosen from hydrogen atoms and alkyl radicals comprising 1 to 4 carbon atoms, such as methyl radicals. In one example, R3 and R4 are each a hydrogen atom. Thus, X may be chosen from linear and branched alkyl radicals comprising 1 to 14 carbon atoms and alkenyl radicals comprising 2 to 14 carbon atoms, and may be optionally substituted and/or optionally interrupted with at least one of oxygen and nitrogen atoms, at least one group bearing at least one hetero atom, and fluorine and chlorine atoms. 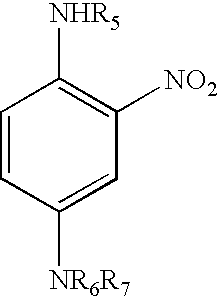 The nitrogen atom, if it is present, may be in a quaternized or non-quaternized form. In this case, the other radical or the other two radicals borne by the quaternized or non-quaternized nitrogen atom may be identical or different and may be chosen from hydrogen atoms and C1–C4 alkyl radicals, such as methyl. According to another embodiment, the group X is chosen from 5- or 6-membered heterocyclic radicals such as imidazolo, pyrazolo, triazino, and pyridino radicals, optionally substituted with at least one of: linear or branched alkyl radicals comprising 1 to 14 carbon atoms, such as 1 to 10 carbon atoms and such as 1 to 4 carbon atoms; linear or branched aminoalkyl radicals comprising 1 to 10 carbon atoms, such as 1 to 4 carbon atoms, optionally substituted with a group comprising at least one hetero atom (for example a hydroxyl radical); and halogen atoms. The amino group may, in one embodiment, be linked to the heterocycle. In accordance with another embodiment, the group X is chosen from aromatic radicals (for example comprising 6 carbon atoms) and fused or non-fused diaromatic radicals (for example comprising from 10 to 12 carbon atoms), optionally separated with an alkyl radical comprising 1 to 4 carbon atoms, the aromatic or diaromatic radicals optionally being substituted with at least one of halogen atoms and alkyl radicals comprising 1 to 10 carbon atoms, such as 1 to 4 carbon atoms, optionally interrupted with at least one of oxygen atoms, nitrogen atoms, and groups comprising at least one hetero atom (for instance carbonyl, carboxyl, amido, amino, and ammonium radicals). The aromatic radical, for example a phenyl radical, is linked to the groups CR3R4 via bonds in positions chosen from 1,2; 1,3; and 1,4, for example in positions 1,3 and 1,4. If the phenyl radical linked via bonds in positions 1,4 bears one or two substituents, this or these substituents may be located in position 1,4 relative to one of the groups CR3R4. If the phenyl radical linked via bonds in positions 1,3 bears one or two substituents, this or these substituents may be located in at least one of positions 1 and 3 relative to one of the groups CR3R4. In the case where the radical is diaromatic, it may be non-fused and comprise two phenyl radicals optionally separated with at least one of single bonds (i.e., a carbon of each of the two rings) and alkyl radicals, such as CH2 and C(CH3)2 radicals. In one example, the aromatic radicals do not bear a substituent. 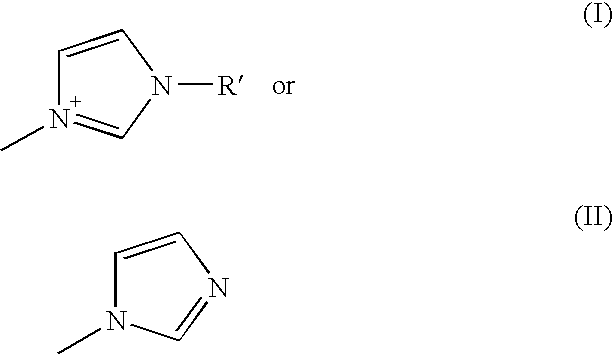 The diaromatic radical is linked to the groups CR3R4 via bonds in positions 4,4′. As examples of groups X that are suitable, mention may be made of linear or branched alkyl radicals comprising 1 to 13 carbon atoms, such as methylene, ethylene, propylene, isopropylene, n-butylene, pentylene, and hexylene; 2-hydroxypropylene and 2-hydroxy-n-butylene; C1–C13 alkylene radicals substituted or interrupted with at least one of nitrogen atoms, oxygen atoms, and groups bearing at least one hetero atom (hydroxyl, amino, ammonium, carbonyl and carboxyl radicals, for example), such as —CH2CH2OCH2CH2—, 1,6-dideoxy-d-mannitol, —CH2N+(CH3)2CH2—, —CH2CH2N+(CH3)2—(CH2)6N+(CH3)2—CH2CH2—, CO—CO—, 3,3-dimethylpentylene, 2-acetoxyethylene, butylene-1,2,3,4-tetraol; —CH═CH—; aromatic or diaromatic radicals substituted with at least one of alkyl radicals, groups bearing at least one hetero atom, and at least one halogen atom, such as 1,4-phenylene, 1,3-phenylene, 1,2-phenylene, 2,6-fluorobenzene, 4,4′-biphenylene, 1,3-(5-methylbenzene), 1,2-bis(2-methoxy)benzene, bis(4-phenyl)methane, methyl 3,4-benzoate, and 1,4-bis(amidomethyl)phenyl; heterocyclic radicals such as pyridine, and derivatives such as the 2,6-bispyridine of imidazole, of imidazolium, and of triazine. C1–C2 alkyl radicals and Re is a C1–C6 alkyl radical; —Rf—N+(Rg)2—Rh— wherein Rf is a linear C2–C9 alkyl radical, Rg, which may be identical, is a C1–C2 alkyl radical and Rh is a linear C1–C6 alkyl radical; and —CO—CO—. Among the anions of mineral origin that may be mentioned, without being limited thereto, are anions derived from halogen atoms, such as chlorides, iodides, sulphates, bisulphates, nitrates, phosphates, hydrogen phosphates, dihydrogen phosphates, carbonates, and bicarbonates. Among the anions of organic origin that may be mentioned are anions derived from the salts of saturated or unsaturated, aromatic or non-aromatic, monocarboxylic or polycarboxylic sulphonic and sulphuric acids, optionally substituted with at least one of hydroxyl and amino radicals, and halogen atoms. Non-limiting examples that are suitable for use include acetates, hydroxyacetates, aminoacetates, (tri)chloroacetates, benzoxyacetates, propionates and derivatives bearing a chlorine atom, fumarates, oxalates, acrylates, malonates, succinates, lactates, tartrates, glycolates, citrates, benzoates and derivatives bearing at least one of methyl and amino radicals, alkyl sulphates, tosylates, benzenesulphonates, and toluenesulphonates, etc. For example, the anions Y, which may be identical or different, may be chosen from chloride, sulphate, methosulphate, and ethosulphate. Finally, the integer n is at least equal to 2 and at most equal to the number of cationic charges present in the fluorescent dye compound. These compounds may be synthesized by reacting, in a first step, α-picoline with a reagent comprising two leaving groups that may be chosen from halogen atoms, such as bromine or chlorine, tolylsulphonyl groups, and methanesulphonyl groups. This first step may take place in the presence of a solvent, for instance dimethylformamide. In addition, the reaction is usually performed at the reflux temperature of the reagent or of the solvent if a solvent is present. In this case also, the reaction may be performed in the presence of a suitable solvent, which may be at reflux. The radicals R1 and R2 of the aldehyde may have the meaning indicated in the general formula detailed previously. Reference may be made for example to syntheses as described in U.S. Pat. No. 4,256,458, the disclosure of which is hereby incorporated by reference. The at least one fluorescent dye present in the composition disclosed herein may represent from 0.01% to 20% by weight, such as from 0.05% to 10% by weight, or from 0.1% to 5% by weight, relative to the total weight of the composition. As mentioned previously, the composition disclosed herein comprises, besides the at least one fluorescent dye, at least one conditioning polymer that is insoluble in the medium of the composition chosen from polyorganosiloxanes which do not bear an amine group. A conditioning agent may have, for example, the function of improving the cosmetic properties of keratin materials such as the hair, for example the softness, disentangling, feel, smoothness, and static electricity. In addition, the expression “insoluble in the medium of the composition,” as used herein, means any compound which, in all or a part of the concentration ranging from 0.01% to 20% by weight, at room temperature, in the medium of the composition, does not form a macroscopically isotropic transparent solution under these conditions. In accordance with one embodiment, the insoluble conditioning agents may be in a dispersed form in the medium of the composition in the form of particles generally having a number-average size ranging from 2 nanometers to 100 microns, such as from 30 nanometers to 20 microns (measured with a granulometer). The insoluble non-amino polyorganosiloxanes (or organosiloxanes or silicones) that are present in the composition may be in the form of oils, waxes, resins, and gums. (i) cyclic silicones comprising from 3 to 7, such as from 4 to 5, silicon atoms. These are, for example, octamethylcyclotetrasiloxane sold under the name Volatile Silicone 7207 by Union Carbide and Silbione 70045 V 2 by Rhodia Chimie, decamethylcyclopentasiloxane sold under the name Volatile Silicone 7158 by Union Carbide, and Silbione 70045 V 5 by Rhodia Chimie, and mixtures thereof. (ii) linear volatile silicones comprising 2 to 9 silicon atoms and having a viscosity of less than or equal to 5×10−6 m2/s at 25° C. An example is decamethyltetrasiloxane sold under the name SH 200 by the company Toray Silicone. Silicones belonging to this category are also described in the article published in Cosmetics and Toiletries, Vol. 91, January 76, pp. 27–32, Todd & Byers “Volatile Silicone Fluids for Cosmetics”. Non-volatile silicones, such as polyalkylsiloxanes, polyarylsiloxanes, polyalkylarylsiloxanes, silicone gums and resins, polyorganosiloxanes modified with organofunctional groups, and mixtures thereof, may be used. According to one embodiment, polyarylsiloxanes, polyalkylarylsiloxanes, silicone gums and resins, polyorganosiloxanes modified with organofunctional groups, and mixtures thereof, may be used. These silicones may be chosen from polyalkylsiloxanes, among which mention may be made of polydimethylsiloxanes comprising trimethylsilyl end groups having a viscosity ranging from 5×1031 6 to 2.5 m2/s at 25° C., such as from 1×10−5 to 1 m2/s. The viscosity of the silicones is measured, for example, at 25° C. according to ASTM standard 445 Appendix C.
Mention may also be made of polydimethylsiloxanes comprising dimethylsilanol end groups (Dimethiconol according to the CTFA name), such as the oils of the 48 series from the company Rhodia Chimie. In this category of polyalkylsiloxanes, mention may also be made of the products sold under the names Abil® Wax 9800 and 9801 by the company Goldschmidt, which are poly(C1–C20)alkylsiloxanes. The polyalkylarylsiloxanes are chosen from linear or branched polydimethylmethylphenylsiloxanes and polydimethyldiphenylsiloxanes with a viscosity ranging from 1×1031 5 to 5×10−2 m2/s at 25° C.
The silicone gums that can be used according to certain embodiments include polydiorganosiloxanes with high number-average molecular masses ranging from 200,000 to 1,000,000, used alone or as a mixture in a solvent. This solvent can be chosen from volatile silicones, polydimethylsiloxane (PDMS) oils, polyphenylmethylsiloxane (PPMS) oils, isoparaffins, polyisobutylenes, methylene chloride, pentane, dodecane, tridecane, and mixtures thereof. Mention may be made of the following products: polydimethylsiloxane, polydimethylsiloxane/methylvinylsiloxane gums, polydimethylsiloxane/diphenylsiloxane, polydimethylsiloxane/phenylmethylsiloxane, and polydimethyl-siloxane/diphenylsiloxane/methylvinylsiloxane. mixtures of two PDMSs with different viscosities, such as mixtures of a PDMS gum and a PDMS oil, such as the product SF 1236 from the company General Electric. The product SF 1236 is a mixture of an SE 30 gum defined above, having a viscosity of 20 m2/s, and an SF 96 oil, with a viscosity of 5×10−6 m2/s. This product may contain 15% SE 30 gum and 85% SF 96 oil. R2SiO2/2, R3SiO1/2, RSiO3/2, and SiO4/2 in which R is chosen hydrocarbon-based groups comprising 1 to 16 carbon atoms and from phenyl groups. Among these products, those that may be mentioned are the ones in which R denotes a C1–C4 lower alkyl radical, such as a methyl or a phenyl radical. Among these resins, mention may be made of the product sold under the name Dow Corning 593 and those sold under the names Silicone Fluid SS 4230 and SS 4267 by the company General Electric, which are silicones of dimethyl/trimethyl siloxane structure. Mention may also be made of the trimethyl siloxysilicate type resins sold for example under the names X22–4914, X21–5034, and X21–5037 by the company Shin-Etsu. The organomodified silicones that can be used in accordance certain embodiments disclosed herein are silicones as defined above and comprising in their structure at least one organofunctional group attached via a hydrocarbon-based radical. These organofunctional compounds are other than amino groups. anionic groups of carboxylic type, such as, for example, in the products described in European Patent No. EP 186 507 from the company Chisso Corporation, or of alkylcarboxylic type, such as those present in the product X-22–3701 E from the company Shin-Etsu; 2-hydroxyalkyl sulphonate; and 2-hydroxyalkyl thiosulphate such as the products sold by the company Goldschmidt under the names Abil S201 and Abil S255. According to certain embodiments, it is also possible to use silicones comprising a polysiloxane portion and a portion comprising a non-silicone organic chain, one of the two portions constituting the main chain of the polymer, the other being grafted onto the said main chain. 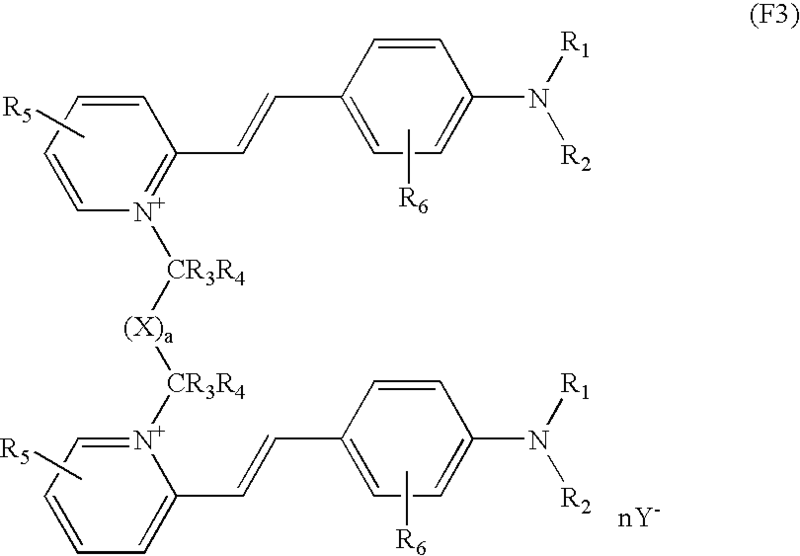 These polymers are described, for example, in Patent Application Nos. EP A 412 704; EP A 412 707; EP A 640 105; WO 95/00578; EP A 582 152,; and WO 93/23009, and U.S. Pat. Nos. 4,693,935; 4,728,571 and 4,972,037. These polymers may be anionic or nonionic. with v being a number ranging from 5 to 700, wherein the weight percentages being calculated relative to the total weight of the monomers. Other examples of grafted silicone polymers include polydimethylsiloxanes (PDMS) onto which are grafted, via a thiopropylene connecting chain unit, mixed poly(meth)acrylic acid and polyalkyl (meth)acrylate polymer units and polydimethylsiloxanes (PDMS) onto which are grafted, via a thiopropylene connecting chain unit, polyisobutyl (meth)acrylate polymer units. The silicones can also be used in the form of emulsions, nanoemulsions, and microemulsions. the organopolysiloxane resin sold under the name Dow Corning 593. The content of insoluble conditioning polymer may range from 0.01% to 20% by weight relative to the total weight of the composition, such as from 0.1% to 10% by weight relative to the total weight of the composition. The cosmetically acceptable medium may comprise water or a mixture of water and of at least one common organic solvent. Among the solvents that are suitable for use, mention may be made of alcohols such as ethyl alcohol, isopropyl alcohol, benzyl alcohol and phenylethyl alcohol, glycols and glycol ethers, for instance ethylene glycol monomethyl ether, monoethyl ether and monobutyl ether, propylene glycol and ethers thereof, for instance propylene glycol monomethyl ether, butylene glycol, dipropylene glycol, and diethylene glycol alkyl ethers, for instance diethylene glycol monoethyl ether and monobutyl ether, and alternatively polyols, for instance glycerol. Polyethylene glycols and polypropylene glycols, and mixtures of all these compounds, may also be used as solvent. The common solvents described above may be present, if present, in an amount ranging from 1% to 40% by weight, for example from 5% to 30% by weight relative to the total weight of the composition. The pH of the disclosed herein may range from 3 to 12, for example from 5 to 11. Examples of acidifying agents that may be mentioned include mineral and organic acids, for instance hydrochloric acid, orthophosphoric acid, sulphuric acid, carboxylic acids, for instance acetic acid, tartaric acid, citric acid, and lactic acid, and sulphonic acids. in which W is a propylene residue optionally substituted with at least one of a hydroxyl group and a C1–C6 alkyl radical; R1, R2, R3 and R4, which may be identical or different, are chosen from hydrogen atoms, C1–C6 alkyl radicals, and C1–C6 hydroxyalkyl radicals. According to one embodiment, the composition may comprise, in addition to the at least one fluorescent dye, at least one additional non-fluorescent direct dye chosen from nonionic, cationic, and anionic direct dyes, which may be chosen, for example, from nitrobenzene dyes. The composition disclosed herein may also comprise, in addition to or instead of these nitrobenzene dyes, at least one additional direct dye chosen from yellow, green-yellow, blue, and violet nitrobenzene dyes, nitrobenzene dyes, azo dyes, anthraquinone dyes, naphthoquinone dyes, benzoquinone dyes, phenothiazine dyes, indigoid dyes, xanthene dyes, phenanthridine dyes, phthalocyanin dyes, triarylmethane-based dyes, and mixtures thereof. These additional direct dyes may be basic dyes, among which mention may be made of the dyes known in the Color Index, 3rd edition, under the names “Basic Brown 16”, “Basic Brown 17”, “Basic Yellow 57”, “Basic Red 76”, “Basic Violet 10”, “Basic Blue 26”, and “Basic Blue 99”, and acidic direct dyes, among which mention may be made of the dyes known in the Color Index, 3rd edition, under the names “Acid Orange 7”, “Acid Orange 24”, “Acid Yellow 36”, “Acid Red 33”, “Acid Red 184”, “Acid Black 2”, “Acid Violet 43”, and “Acid Blue 62”, and alternatively cationic direct dyes such as those described in Patent Application Nos. WO 95/01772, WO 95/15144, and EP 714 954, the content of which is incorporated by reference herein. R5 and R7, which may be identical or different, are chosen from β-hydroxyethyl, β-hydroxypropyl, γ-hydroxypropyl, and β,γ-dihydroxypropyl radicals, at least one of the radicals R6, R7, and R5 is a γ-hydroxypropyl radical and R6 and R7 are not simultaneously a β-hydroxyethyl radical when R5 is a γ-hydroxypropyl radical, such as those described in French Patent No. FR 2 692 572. When present, the at least one additional direct dye is present in an amount ranging from 0.0005% to 12% by weight relative to the total weight of the composition, such as from 0.005% to 6% by weight relative to this weight. 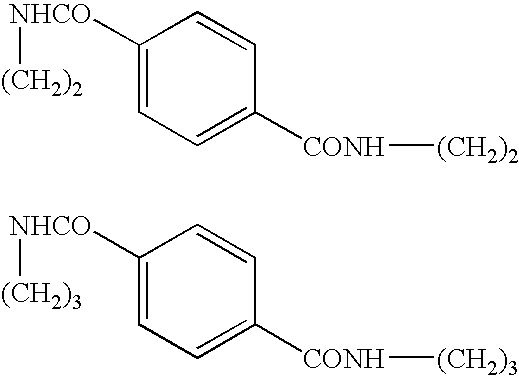 When it is intended for oxidation dyeing, the composition disclosed herein may comprise, in addition to the at least one fluorescent dye compound, at least one oxidation base chosen from the oxidation bases conventionally used for oxidation dyeing and among which mention may be made of para-phenylenediamines, bis(phenyl)alkylenediamines, para-aminophenols, ortho-aminophenols, heterocyclic bases, and the acid and alkaline addition salts thereof. When it is used, the at least one oxidation base may be present in an amount ranging from 0.0005% to 12% by weight relative to the total weight of the composition, such as from 0.005% to 6% by weight relative to this weight. When it is intended for oxidation dyeing, the composition disclosed herein may also comprise, in addition to the at least one fluorescent dye and the at least one oxidation base, at least one coupler so as to modify and/or to enrich with glints the shades obtained using the at least one fluorescent dye and the at least one oxidation base. The at least one coupler that may be used in the composition disclosed herein may be chosen from the couplers conventionally used in oxidation dyeing, and among which mention may be made of meta-phenylenediamines, meta-aminophenols, meta-diphenols, heterocyclic couplers, and the acid and alkaline addition salts thereof. This at least one coupler may be chosen from 2-methyl-5-aminophenol, 5-N-(β-hydroxyethyl)amino-2-methylphenol, 3-aminophenol, 1,3-dihydroxybenzene, 1,3-dihydroxy-2-methylbenzene, 4-chloro-1,3-dihydroxybenzene, 2,4-diamino-1-(β-hydroxyethyloxy)benzene, 2-amino-4-(β-hydroxyethylamino)-1-methoxybenzene, 1,3-diaminobenzene, 1,3-bis(2,4-diaminophenoxy)propane, sesamol, α-naphthol, 6-hydroxyindole, 4-hydroxyindole, 4-hydroxy-N-methylindole, 6-hydroxyindoline, 2,6-di-hydroxy-4-methylpyridine, 1H-3-methylpyrazol-5-one, 1-phenyl-3-methylpyrazol-5-one, 2,6-dimethylpyrazolo[1,5-b]-1,2,4-triazole, 2,6-dimethyl[3,2-c]-1,2,4-triazole, 6-methylpyrazolo[1,5-a]benzimidazole, and the acid and alkaline addition salts thereof. In general, the acid addition salts that may be used in the context of the compositions disclosed herein (oxidation bases and couplers) may be chosen from hydrochlorides, hydrobromides, sulphates, citrates, succinates, tartrates, tosylates, benzenesulphonates, lactates, and acetates. The alkaline addition salts that may be used in the context of the compositions disclosed herein (oxidation bases and couplers) may be chosen from the alkali metal addition salts and the alkaline-earth metal addition salts, ammonium addition salts, and organic amine addition salts, including alkanolamines and the compounds of formula (A). The composition in accordance certain embodiment may also comprise various conventionally used adjuvants, such as anionic, cationic, nonionic, amphoteric, and zwitterionic surfactants and mixtures thereof, anionic, cationic, nonionic, amphoteric, and zwitterionic polymers other than those disclosed herein, and mixtures thereof, mineral thickeners, antioxidants, penetrating agents, sequestering agents, fragrances, buffers, dispersants, conditioners, for instance cations, film-forming agents, ceramides, preserving agents, stabilizers, and opacifiers. Among the thickeners that may be mentioned are thickening systems based on associative polymers that are well-known to those skilled in the art, such as nonionic, anionic, cationic, andamphoteric associative polymers. Moreover, when they are present, surfactants, such as nonionic, anionic, and amphoteric surfactants, may be present in an amount ranging from 0.01% to 30% by weight relative to the weight of the composition. The composition disclosed herein may be in various forms, such as in the form of liquids, shampoos, creams, gels, and in any other suitable form. In one form that may be mentioned according to certain embodiments, the composition is in the form of a lightening dye shampoo comprising, in a cosmetically acceptable aqueous medium, the composition disclosed herein. In the composition disclosed herein, when at least one oxidation base is used, optionally in the presence of at least one coupler, or when the at least one fluorescent dye is used in the context of a lightening direct dyeing, then the composition may also comprise at least one oxidizing agent. The oxidizing agent may be chosen, for example, from hydrogen peroxide, urea peroxide, alkali metal bromates, persalts such as perborates and persulphates, and enzymes such as peroxidases and two-electron and four-electron oxidoreductases. In one embodiment, the oxidizing agent may be chosen from hydrogen peroxide and enzymes. One embodiment is also the use of a composition comprising, in a cosmetically acceptable medium, at least one soluble fluorescent dye in the medium, at least one insoluble conditioning polymer in the medium, chosen from polyorganosiloxanes which do not bear an amine group, for coloring human keratin materials with a lightening effect. According to this embodiment, the at least one fluorescent dye may be chosen from fluorescent dyes belonging to the following families: naphthalimides; cationic coumarins; non-cationic coumarins; xanthenodiquinolizines; azaxanthenes; naphtholactams; azlactones; oxazines; thiazines; dioxazines; azo, azomethine, and methane monocationic fluorescent dyes; and azo, azomethine, and methane polycationic fluorescent dyes, alone or as mixtures. Other compounds that may be mentioned include the compounds of formulae F1, F2 and F3 already detailed previously. in which formula R is chosen from methyl and ethyl radicals; R′ represents a methyl radical, and X31 is an anion such as chloride, iodide, sulphate, methosulphate, acetate, or perchlorate. 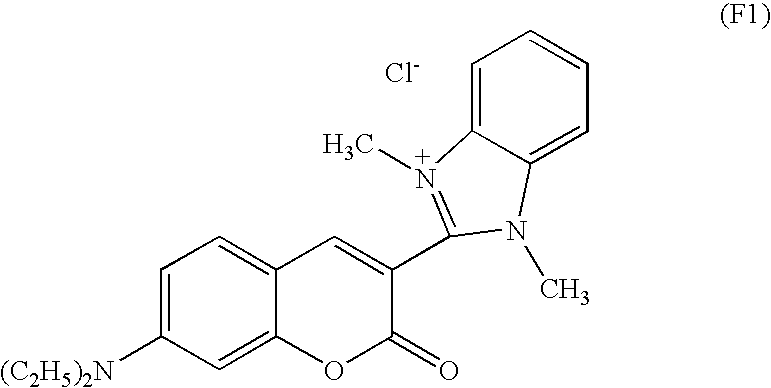 An example of a compound of this type that may be mentioned is the Photosensitizing Dye NK-557 sold by the company Ubichem, for which R represents an ethyl radical, R′ represents a methyl radical, and X− represents an iodide. Everything that has been detailed above regarding the nature and amounts of the various ingredients used herein remains valid and will not be repeated in this section of the text. As used herein, the term “human keratin materials” means the skin, the hair, the nails, the eyelashes, and the eyebrows, for example dark skin and artificially colored and/or pigmented hair. As used herein, the term “dark skin” means a skin whose lightness L* measured in the CIEL L*a*b* system is less than or equal to 45, for example less than or equal to 40, given that L*=0 is equivalent to black and L*=100 is equivalent to white. The skin types corresponding to this lightness may be African skin, Afro-American skin, Hispano-American skin, Indian skin and North African skin. Another embodiment is also a process for coloring dark skin with a lightening effect, in which the composition that has just been described is applied to the skin and the skin is then dried or is left to dry. In certain embodiments, this composition does not comprise any oxidation base or coupler and is not used in the presence of an oxidizing agent. Everything that has been described above regarding the various constituent components of the composition remains valid, and reference may be made thereto. The processes disclosed herein are suitable for treating human keratin fibers, such as artificially colored and/or pigmented hair, and alternatively dark skin. Additionally, the fibers that may be treated with the processes disclosed herein have a tone height of less than or equal to 6 (e.g., dark blond), for example less than or equal to 4 (e.g., chestnut-brown). Furthermore, a dark skin capable of being treated according to the processes disclosed herein has a lightness L*, measured in the CIEL L*a*b* system, of less than or equal to 45, for example less than or equal to 40. According to one embodiment, the process of dyeing fibers with a lightening effect is performed with a composition that does not comprise any oxidation dyes or couplers and in the absence of an oxidizing agent. According to another embodiment, the process of dyeing fibers with a lightening effect is performed with a composition that does not comprise any oxidation dyes or couplers, but in the presence of at least one oxidizing agent. According to another embodiment of these dyeing processes, at least one composition as defined above is applied to the fibers, such as the hair, for a time that is sufficient to develop a desired coloration and lightening, after which the fibers are rinsed, optionally washed with shampoo, rinsed again, and dried. According to yet another embodiment of these dyeing processes, at least one composition as defined above is applied to the fibers, such as the hair, without final rinsing. According to another embodiment, the dyeing process comprises a preliminary step that comprises separately storing, on the one hand, a composition as disclosed herein optionally comprising at least one oxidation base and optionally comprising at least one coupler, and, on the other hand, a composition comprising, in a cosmetically acceptable medium, at least one oxidizing agent, and then in mixing them together at the time of use, after which this mixture is applied to the keratin fibers, such as the hair, for a time that is sufficient to develop the desired coloration, after which the fibers are rinsed, optionally washed with shampoo, rinsed again, and dried. The time required to develop the coloration and to obtain the lightening effect on the fibers, such as the hair, ranges from about 5 to 60 minutes, for example from about 5 to 40 minutes. The temperature required to develop the coloration and to obtain the lightening effect may range from room temperature (15° C. to 25° C.) to 80° C., for example from 15° C. and 40° C.
Another embodiment is a multi-compartment device for dyeing keratin fibers, such as the hair, with a lightening effect, comprising at least one compartment containing a composition as disclosed herein, and at least one other compartment containing a composition comprising at least one oxidizing agent. This device may be equipped with a means for applying the desired mixture to the fibers, such as the devices described in French Patent No. FR 2 586 913. This means that, in the wavelength range from 500 to 700 nanometers, such as from 540 to 700 nanometers, there is at least one range in which the reflectance curve corresponding to the treated hair is higher than the reflectance curve corresponding to the untreated hair. As used herein, the term “higher than” means a difference of at least 0.05%, such as at least 0.1%, of reflectance. However, it is pointed out that there may be, within the wavelength range from 500 to 700 nanometers, such as from 540 to 700 nanometers, at least one range in which the reflectance curve corresponding to the treated fibers is either super-imposable on or lower than the reflectance curve corresponding to the untreated fibers. In certain embodiments, the wavelength at which the difference is maximal between the reflectance curve for the treated hair and that for the untreated hair is in the wavelength range from 500 to 650 nanometers, such as the wavelength range from 550 to 620 nanometers. In addition, the composition disclosed herein may be capable of lightening the hair and the skin in a shade which, measured in the CIEL L*a*b* system, has a variable b* of greater than or equal to 6, with a b*/absolute value of a* ratio of greater than 1.2 according to the selection test described below. The composition is applied to chestnut-brown keratin fibers, such as the hair, at a rate of 10 grams of composition per 1 gram of chestnut-brown fibers. The composition is spread on so as to cover all of the fibers. The composition is left to act for 20 minutes at room temperature (20° C. to 25° C.). The fibers are then rinsed with water and then washed with a lauryl ether sulphate-based shampoo. The fibers are then dried. The spectrocolorimetric characteristics of the fibers are then measured in order to determine the L*a*b* coordinates. In the CIEL L*a*b* system, a* and b* indicate two color axes: a* indicates the green/red color axis (+a* is red, −a* is green), and b* indicates the blue/yellow color axis (+b* is yellow and −b* is blue); values close to zero for a* and b* correspond to grey shades. Other than in the operating example, or where otherwise indicated, all numbers expressing quantities of ingredients, reaction conditions, and so forth used in the specification and claims are to be understood as being modified in all instances by the term “about.” Accordingly, unless indicated to the contrary, the numerical parameters set forth in the following specification and attached claims are approximations that may vary depending upon the desired properties sought to be obtained by the present invention. At the very least, and not as an attempt to limit the application of the doctrine of equivalents to the scope of the claims, each numerical parameter should be construed in light of the number of significant digits and ordinary rounding approaches. Notwithstanding that the numerical ranges and parameters setting forth the broad scope of the invention are approximations, the numerical values set forth in the specific examples are reported as precisely as possible. Any numerical value, however, inherently contain certain errors necessarily resulting from the standard deviation found in their respective testing measurements. The following example is intended to illustrate the invention without limiting the scope as a result. 109 g of the product obtained above were dissolved in methanol, and 82.82 g of p-dimethylaminobenzaldehyde were added in two portions, in the presence of pyrrolidine. The composition was applied to a lock of chestnut-brown natural hair of tone height 4 with a leave-in time of 20 minutes, a final rinsing operation, and a drying operation under a hood for 30 minutes. A lock of hair with a marked lightening effect was obtained. (ii) at least one conditioning polymer that is insoluble in said medium, wherein the at least one conditioning polymer is chosen from polyorganosiloxanes which do not bear an amine group. 3. A composition according to claim 2, wherein the at least one fluorescent dye leads to a reflectance maximum that is in the wavelength range from 550 to 620 nanometers. 5. A composition according to claim 1, wherein R1 and R2, which may be identical or different, are linked so as to form a heterocycle with the nitrogen atom and comprise at least one other hetero atom, the heterocycle being substituted with at least one linear or branched alkyl radical comprising 1 to 4 carbon atoms. 9. A composition according to claim 1, wherein the at least one insoluble conditioning polymer is chosen from silicones in the form of oils, waxes, resins, and gums. 10. A composition according to claim 9, wherein the silicones are chosen from cyclic volatile silicones comprising from 3 to 7 silicon atoms, cyclocopolymers, linear volatile silicones comprising from 2 to 9 silicon atoms, non-volatile polyalkylsiloxane, polyarylsiloxane, polyalkylarylsiloxane and polyorganosiloxane silicones modified with organofunctional groups, grafted silicones comprising a polysiloxane portion and a portion comprising a non-silicone organic chain, and polydiorganosiloxane, organopolysiloxane and trimethylsiloxysilicate resins, and mixtures thereof. 11. A composition according to claim 10, wherein the organofunctional groups are chosen from polyethyleneoxy and polypropyleneoxy groups optionally comprising alkyl groups, thiol groups, alkoxylated groups, hydroxylated groups, acyloxyalkyl groups, and carboxylic, sulphonate, and thiosulphate anionic groups. 12. A composition according to claim 1, wherein the at least one insoluble conditioning polymer is present in an amount ranging from 0.01% to 20% by weight relative to the total weight of the composition. 13. A composition according to claim 12, wherein the at least one insoluble conditioning polymer is present in an amount ranging from 0.1% to 10% by weight relative to the total weight of the composition. 14. A composition according to claim 1, further comprising at least one surfactant chosen from nonionic, anionic, and amphoteric surfactants. 15. A composition according to claim 14, wherein the surfactant is present in an amount ranging from 0.01% to 30% by weight relative to the total weight of the composition. 16. A composition according to claim 1, further comprising at least one non-fluorescent additional direct dye chosen from nonionic, cationic, and anionic direct dyes. 17. A composition according to claim 16, wherein the at least one non-fluorescent additional direct dye is chosen from nitrobenzene dyes, azo dyes, anthraquinone dyes, naphthoquinone dyes, benzoquinone dyes, phenothiazine dyes, indigoid dyes, xanthene dyes, phenanthridine dyes, phthalocyanin dyes, and triarylmethane-based dyes. 18. A composition according to claim 16, wherein the at least one non-fluorescent additional direct dye is present in an amount ranging from 0.0005% to 12% by weight relative to the total weight of the composition. 19. A composition according to claim 18, wherein the at least one non-fluorescent additional direct dye is present in an amount ranging from 0.005% to 6% by weight relative to the total weight of the composition. 20. A composition according to claim 1, wherein the composition is in the form of a lightening dyeing shampoo. 21. A composition according to claim 1, further comprising at least one oxidation base chosen from para-phenylenediamines, bis(phenyl)alkylenediamines, para-aminophenols, ortho-aminophenols, heterocyclic bases, and the acid and alkaline addition salts thereof. 22. A composition according to claim 21, wherein the at least one oxidation base is present in an amount ranging from 0.0005% to 12% by weight relative to the total weight of the composition. 23. A composition according to claim 22, wherein the at least one oxidation base is present in an amount ranging from 0.005% to 6% by weight relative to the total weight of the composition. 24. 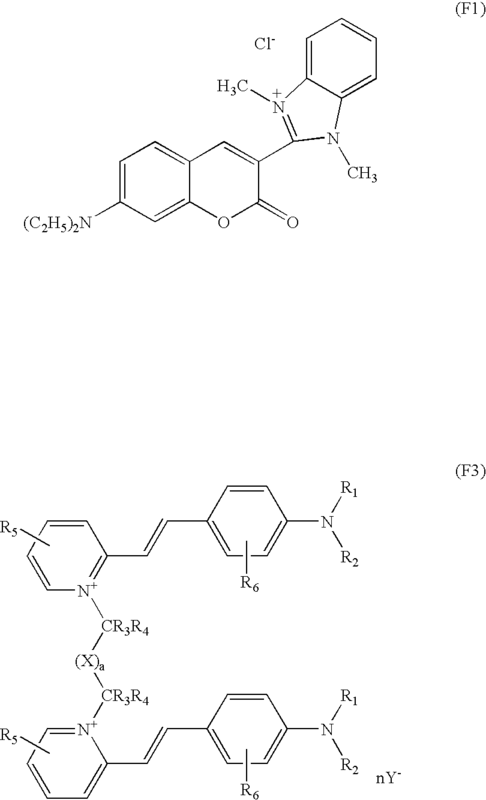 A composition according to claim 21, further comprising at least one coupler chosen from meta-phenylenediamines, meta-aminophenols, meta-diphenols, heterocyclic couplers, and the acid and alkaline addition salts thereof. 25. A composition according to claim 24, wherein the at least one coupler is present in an amount ranging from 0.0001% to 10% by weight relative to the total weight of the composition. 26. A composition according to claim 25, wherein the at least one coupler is present in an amount ranging from 0.005% to 5% by weight relative to the total weight of the composition. 27. A composition according to claim 1, further comprising at least one oxidizing agent. 28. A composition according to claim 27, wherein the at least one oxidizing agent is chosen from hydrogen peroxide, urea peroxide, alkali metal bromates, persalts, and enzymes. 29. A composition according to claim 28, wherein the persalts are chosen from perborates and persulphates. 30. A composition according to claim 28, wherein the enzymes are chosen from peroxidases, two electron oxidoreductases, and four electron oxidoreductases. 31. A composition according to claim 28, wherein the at least one oxidizing agent is hydrogen peroxide. 32. A composition according to claim 1, wherein the at least one fluorescent dye compound is a dye in the orange range. f) drying said fibers or leaving said fibers to dry. 35. A process according to claim 33, wherein the composition is applied to hair with a tone height of less than or equal to 6. 36. A process according to claim 35, wherein the composition is applied to hair with a tone height of less than or equal to 4. 37. A process according to claim 33, wherein the human keratin fibers are artificially colored and/or pigmented. at least one other compartment containing a composition comprising at least one oxidizing agent. (ii) at least one conditioning polymer that is insoluble in the said medium, said at least one conditioning polymer being chosen from polyorganosiloxanes not bearing an amino group. 41. A process according to claim 40, wherein the at least one fluorescent dye gives a reflectance maximum that is in the wavelength range from 500 to 650 nanometers. 42. A process according to claim 41, wherein the at least one fluorescent dye gives a reflectance maximum that is in the wavelength range from 550 to 618 nanometers. 43. A process according to claim 40, wherein the at least one fluorescent dye is chosen from fluorescent compounds belonging to the following families; naphthalimides; cationic coumarins; non-cationic coumarins; xanthenodiquinolizines; azaxanthenes; naphtholactams; azlactones; oxazines; thiazines; dioxazines; azo, azomethine, and methine type monocationic fluorescent dyes; azo, azomethine, and methine type polycationic fluorescent dyes; and mixtures thereof. in which formula R is chosen from methyl and ethyl radicals; R′ is a methyl radical and X− is an anion. 45. A process according to claim 40, wherein R1 and R2, which may be identical or different, are chosen from linear and branched alkyl radicals comprising 1 to 4 carbon atoms. 46. A process according to claim 40, wherein R1 and R2, which may be identical or different, are linked so as to form a heterocycle with the nitrogen atom and comprise at least one other hetero atom, the heterocycle being substituted with at least one linear or branched alkyl radical comprising 1 to 4 carbon atoms. 47. A process according to claim 44, wherein X is an anion chosen from chloride, iodide, sulphate, methasulphate, acetate, and perchlorate. 48. A process according to claim 41, wherein the keratin materials are artificially colored and/or pigmented keratin fibers. 49. A process according to claim 48, wherein the keratin material is hair. 50. A process according to claim 48, wherein the keratin material is dark skin. 51. A process according to claim 49, wherein the hair has a tone height of less than or equal to 6. 52. A method according to claim 51, wherein the hair has a tone height of less than or equal to 4. English Language Abstract of JP 2001-302473 from EPO website. English Language Abstract of JP 2001-516705 from EPO website. English Language Abstract of JP 2002-326911 from EPO website. English Language Abstract of JP 9-183714 from EPO website. English Language Derwent Abstact of JP 8-208448. English Language Derwent Abstact of JP 8-259426. French Search Report for French Patent Application No. FR 02/16669, priority document for Co-pending U.S. Appl. No. 10/742,995, filed Aug. 6, 2003. French Search Report for French Patent Application No. FR 03/04021, priority document for U.S. Appl. No. 10/814,337, filed Dec. 8, 2003. French Search Report for French Patent Application No. FR 03/04022, priority document for Co-pending U.S. Appl. No. 10/814,336, filed Nov. 20, 2003. French Search Report for French Patent Application No. FR 03/04024, priority document for Co-pending U.S. Appl. No. 10/814,585, filed Dec. 8, 2003. French Search Report for French Patent Application No. FR 03/04026, priority document for Co-pending U.S. Appl. No. 10/814,335, filed Nov. 21, 2003. French Search Report for French Patent Application No. FR 03/04027, priority document for Co-pending U.S. Appl. No. 10/814,428, filed Nov. 28, 2003. French Search Report for French Patent Application No. FR 03/04028, priority document for Co-pending U.S. Appl. No. 10/814,236, filed Nov. 25, 2003. French Search Report for French Patent Application No. FR 03/04029, priority document for Co-pending U.S. Appl. No. 10/814,430, filed Feb. 5, 2004. French Search Report for French Patent Application No. FR 03/04030, priority document for Co-pending U.S. Appl. No. 10/814,300, filed Nov. 27, 2003. French Search Report for French Patent Application No. FR 03/04031, priority document for Co-pending U.S. Appl. No. 10/814,333, filed Jan. 8, 2004. French Search Report for French Patent Application No. FR 03/04033, priority document for Co-pending U.S. Appl. No. 10/814,334, filed Nov. 28, 2003. French Search Report for French Patent Application No. FR 03/04034, priority document for Co-pending U.S. Appl. No. 10/814,338, filed Feb. 17, 2004. French Search Report for French Patent Application No. FR 03/04035, priority document for Co-pending U.S. Appl. No. 10/814,305, filed Feb. 5, 2004.
International Search Report for PCT Application No. PCT/FR 02/03252, (for Co-pending U.S. Appl. No. 10/490,869), filed Jan. 20, 2003. Office Action mailed Jun. 8, 2006 in Co-pending U.S. Appl. No. 10/814,430.